Donovan, 61, was born Deaf and into a loving generation of Deaf family members. For Donovan, Australian Sign Language (Auslan), is his native language and written English his second language. However, it wasn’t until he met close friend Barry on a basketball court aged ten, that he realised not all children with a hearing impairment grow up with families communicating in Auslan, the language of the Australian Deaf community. “My parents are Deaf, my brothers, sisters and nieces are also Deaf. Deafness extends across four generations in my family with my grandparents and their kids also born Deaf. I was raised learning Auslan and assumed all Deaf kids grew up in a similar environment,” said Donovan. When Donovan met Barry, they became friends instantly. It wasn’t long before Donovan realised that for Barry, growing up with parents that didn’t sign was a lonely experience. This was a pivotal moment for both of them and the beginning of a beautiful friendship and partnership. 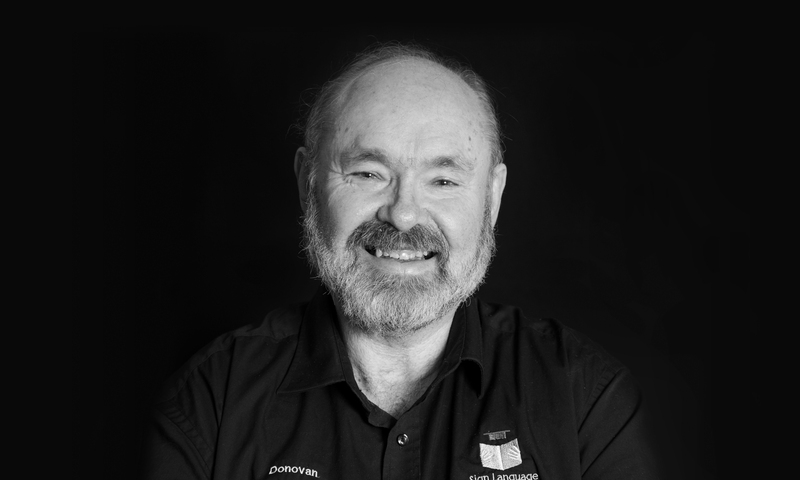 Today, Donovan is instrumental in connecting the hearing and Deaf community through Sign Language Australia; a business which he founded with Barry. Together they’re on a mission to improve the lives of their fellow Deaf Australians, by sharing the language and culture of the Deaf community with the Deaf, hard of hearing or hearing communities. Sign Language Australia has been operating for one year and through the support of WISE Employment, Donovan has been able to extend the program offering with workshops for children with autism. “I work with a lot of Deaf children and a lot of them have no knowledge of Auslan, with their parents wanting them to go to a mainstream school using oral language. These children become frustrated with the mainstream oral language – they need the visual language of Auslan to communicate. I know how frustrating it was for Barry growing up and hopefully in time the parents we meet will start to embrace Auslan primarily, combined with the oral language,” explained Donovan. For Donovan, connecting the Deaf community with the hearing community is a real passion. Donovan married a hearing woman and together they have a daughter who hears; contributing to his desire to teach those that are willing to learn and fine-tune their Auslan skills in the wider community. In terms of the wider community, one thing that Donovan is most proud of is developing a ‘Totally Auslan Weekend Camp’ program with Barry. This camp means “voices are off” for the entire weekend as beginners partake in a number of Auslan lessons and activities whilst also putting their skills to practice with role playing. “I love that my day job enables me to help people embrace the Deaf culture in a number of different ways, be it through workshops, training or weekend camps. It’s been a great journey and with the support of organisations such as WISE Employment my hope is that we continue to grow, employ more staff and help more people,” said Donovan. As Donovan’s aspirations for Sign Language Australia grow, so too does his friendship with long-time friend and business partner Barry. To find out what’s in store next, please visit Sign Language Australia on Facebook.